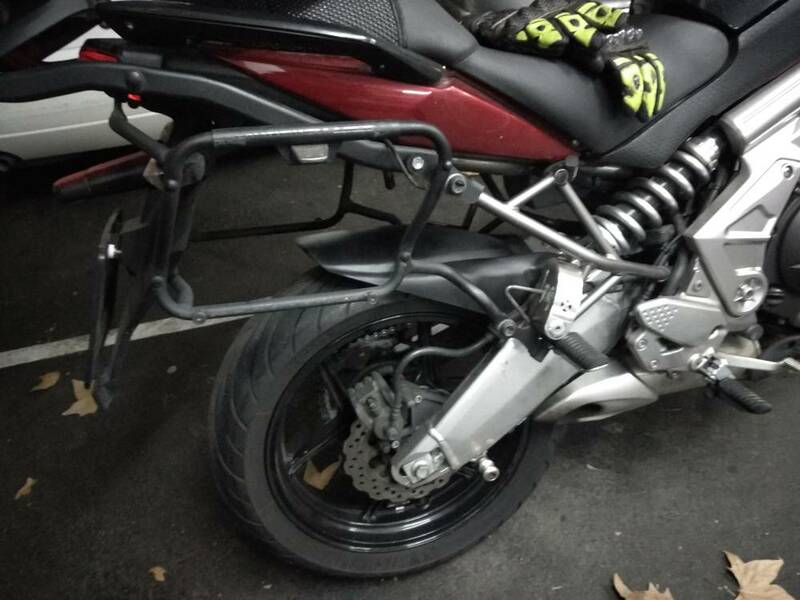 Well I took a chance to save some money and bought the EB copy rear hugger for my 2015 Versys. Paid $40 and it arrived in perfect condition and very well made. Actually better than I expected and with real nice bolts. Install was easy but no instructions were included. I also reinstalled the chain guard and it works great. I am pleased. weljo2001, Doug Just Doug and otto_versys_blotto like this. looks fine, thanks for sharing! Getting decent hardware from China is the surprise. May order one; thanks. That is a great find. I installed what looks to be the same exact hugger on my 2015, unfortunately I paid almost triple what you got yours for. I really like the looks of it on the bike. Gives the bike a factory finished look at the rear end. I always thought without a hugger the bike looked kinda unfinished. Here's a link for a pic of the china hugger I bought and installed. it's a great cheap option that fits perfect. It's the same one that was linked above. 2010 Aprilia Shiver 750 "Ruthy"
2018 Kawasaki Versys 650LT ABS "Lucy"
Just installed mine, it fits great! I think it looks as if istock, Kawa needs to install these from the beginning! Need to get one , as my old fender-local made has crack in it. Thanks for the info...great find. I bought it and installed it and rode in the rain with it. I must say I'm pretty disappointed with its performance. My underside gets pretty nasty still, only difference is that the spray can't get all the way in to the rear of the engine. 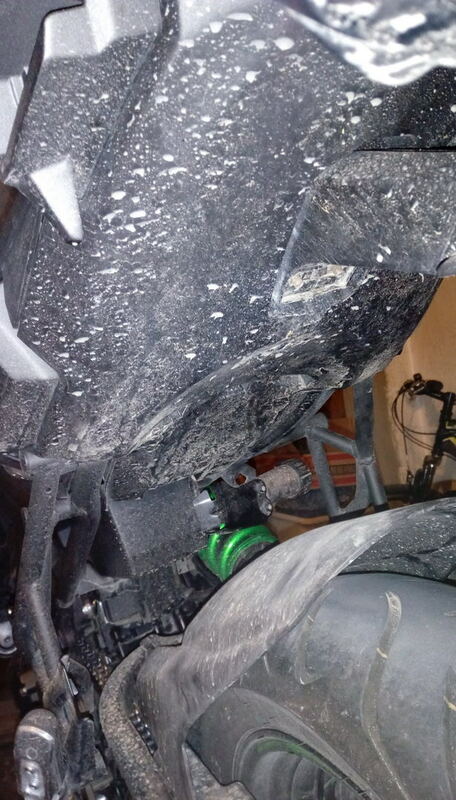 Everything else still gets dirty, rear shock included. I guess it's better than before but I expected more. P.S. 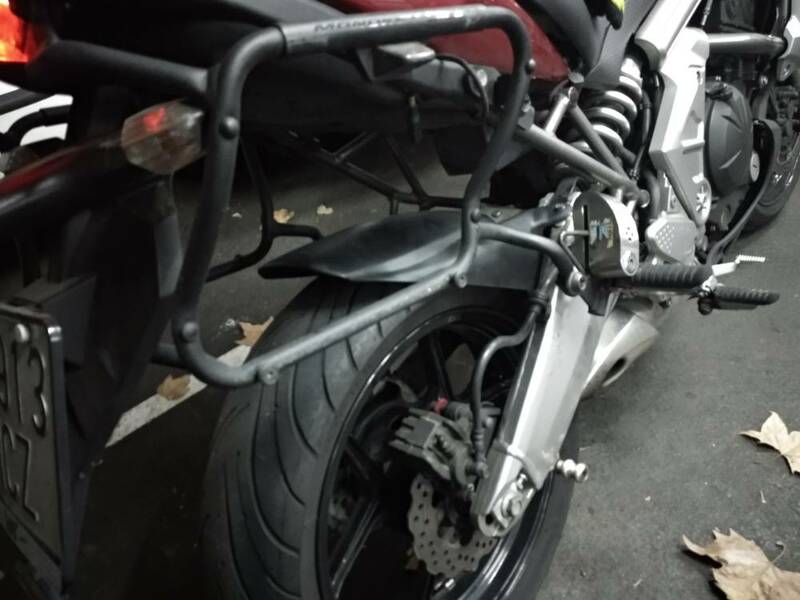 Whoever plans on doing this on 2017 V or newer (don't know about older models), don't make the mistake of thinking the little plastic thingy that looks like an insert inside the swingarm where the top bolt goes is removable with pliers. It's not, because it's not actually an insert, it's a goddamn plastic bolt that needs to be unscrewed. If you try to pull it out like I did, it will only deform and break and then you'll have to spend 3 hours trying to pry out the rest of the hard plastic stuck inside. I even used gasoline to soften it so I could pull pieces of it out enough for the proper steel bolt to fit in. Last edited by NightRider; 10-31-2018 at 12:59 AM. Night Rider , i am very puzzled as to why your hugger is not serving its intended purpose. I have one that much shorter in length and i don't get that much dirt on my bike....just don't make sense. To me that looks like what to expect from riding on a road that had stone dust used, which helps to harden up a gravel road just before paving, also used if you plan on paving your driveway. I have a Skidmarx hugger, and I have had my bike looking the same way, after riding less than 1 KM on this type of road, in the rain. Best way to describe it is watching someone use a diamond saw to cut concrete with water, that creamy slurry sticks to everything. There is at least some benefit like I mentioned, and that's the rear side of the engine being protected from dirt. Overall though, the protection is marginal at best. 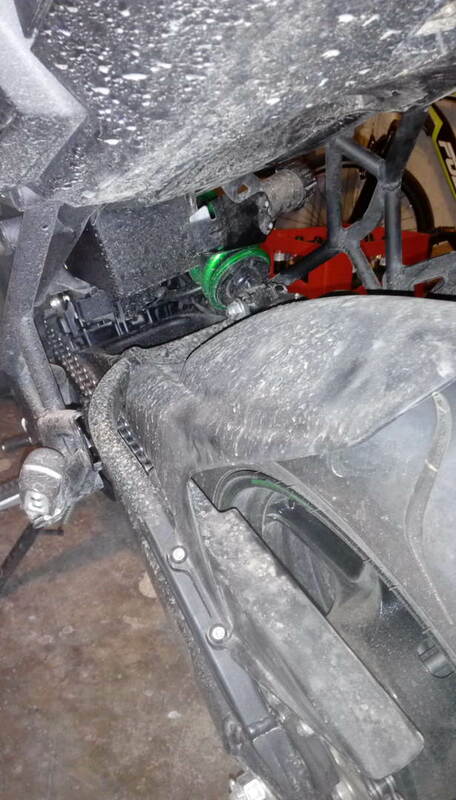 Maybe that's why Kawasaki didn't bother putting a stock hugger on. NightRider, how do you "unscrew" that bolt/insert since it has no edges? It probably has a notch under the cap, I assume. It has to have something because it IS a bolt, that I'm sure of. Any chance that is just super tight and not threaded? Wish they showed a close up of the "rivet". I have no clue how you would be able to unscrew this thing being that the head is super smooth. Cut a slot in the top and back it out with a screwdriver. Might work, depends how tight the fit is. It appears to be a cosmetic piece to plug the unused hole. That was my 1st thought, until i really noticed how thin the head is on that thing. I think if I tried to cut a groove in it deep enough for a slotted screw driver, it would split in two. 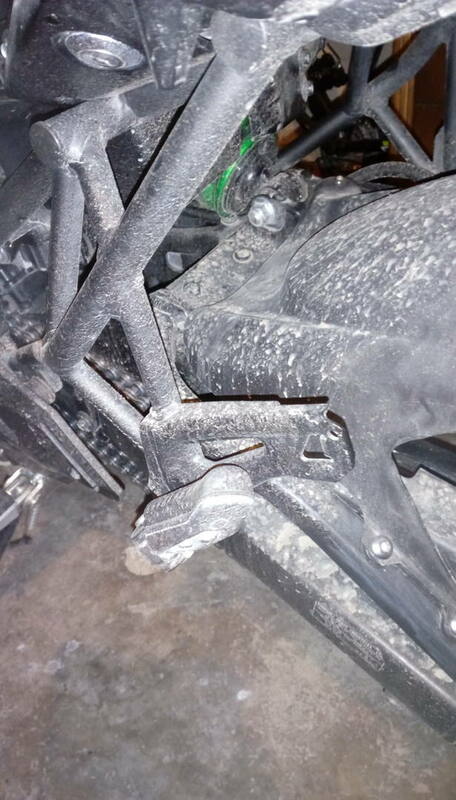 Had a look at my bike, which has a skidmarx hugger on it, found my bag of parts removed, brake hose mounting bracket, screws, chain guard , no plastic screw. I don't remember what happened to it, however, assume 99% of all threads are standard left hand, ( mirror and shifter linkage the exception), use a blunt slot screw driver, at a 30' angle tap the head in a CCW direction, what we are trying to accomplish is similar to the orange area , by driving CCW with the slot screw driver , blade at right angles to the head, you are using all the plastic, if I recall , although it is really a distant memory, a 1/4 turn and I used my fingers to extract it,the rest of the way,then threw it away. Last edited by onewizard; 11-01-2018 at 10:15 AM. No chance. It's tight AND threaded AND screwed all the way in. Trust me, I've done the hard part of pulling pieces of it out and if it were just a plastic rivet/insert, it would've popped out. I almost damaged the swingarm thread in the process because I used a pointy tool from a precision tool set just to be able to pry as much of it out as possible (because it's super hard plastic). It's a plastic bolt alright, with a normal thread, just figure out how to unscrew it or you're in for a few hours of headache tying to make room for the steel bolt to go in. P.S. Try cutting in a very small cross on top and using a Phillips screwdriver, you'll have more leverage with less room. Last edited by NightRider; 11-02-2018 at 01:02 AM.